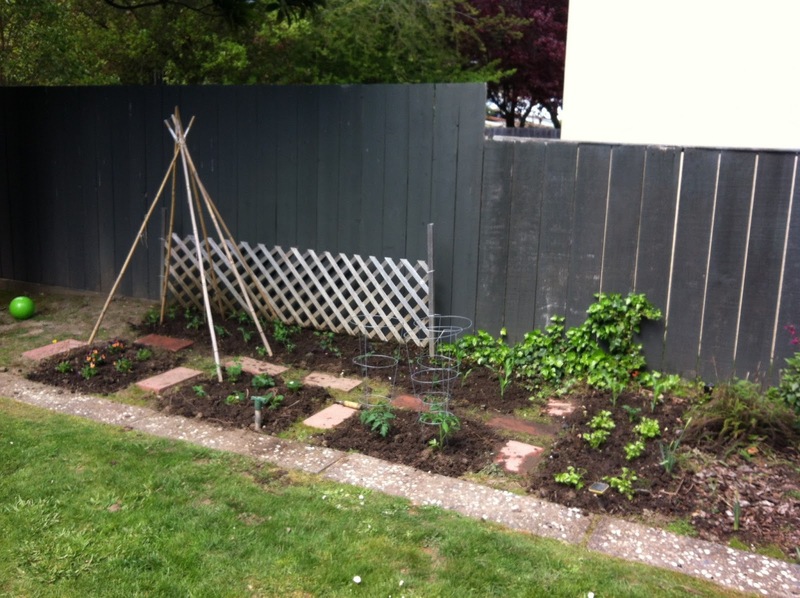 Home » Family Fitness » Gardening » Health » How Does Your Garden Grow? My parents have always had a beautiful and abundant garden, with an orchard's worth of fruit varieties and plants that drip with tomatoes, peppers, peas, squash, eggplant, and berries. They never visit us without bringing fresh lettuce, herbs or other earthy delights. They spend hours planting and maintaining their garden and they pretty much harvest from it year-round. I have admiration for their bounty and in some cases their techniques (on one occasion, my mom purposefully backed her truck into a recalcitrant apple tree to give it a little wake up call as it had not produced fruit in a few years - darn if that tree hasn't produced bushels of apples since). Apparently, you don't mess around with a master gardener. By comparison, to call me a "gardener" would be a great deal more than a stretch. It would be a kind and generous and wholly undeserved accolade. I appreciate a beautiful garden, but don't really have the inclination towards pouring through gardening literature or seed catalogs, designing a garden, or tending to plants. However, I do subscribe to Sunset Magazine (mostly for the trip ideas), compost religiously, and spend a couple of weekends every year buying plants and getting dirty with the kids while we plant our tiny vegetable garden. It is our little way of stepping outside our urban environment, and connecting with my childhood and with our food. It has been a great teaching tool in terms of soil ecology, plant biology and healthy food sourcing. Most importantly, it has been a lot of fun - Show me a kid who doesn't love checking out a shovel full of fresh compost that is absolutely alive with earthworms? Or eating fresh cherry tomatoes, peas or strawberries straight from the vine? 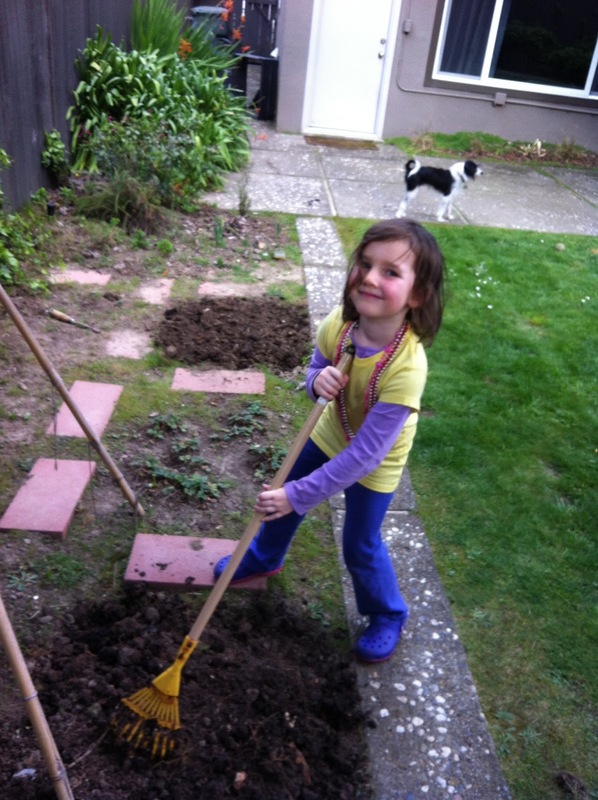 My nothing-to-brag-about gardening efforts started the year my daughter was born. I suddenly found myself spending hours every day at home with her, much of that time in our backyard as she toddled about on the grass after a ball or swung in the baby swing. Looking for a way to channel some energy, I decided that now would be a great time to become one of those wholesome families that grew our own food. I imagined us having a garden bursting with color and flavor. I could envision my daughter harvesting veggies with her chubby little paws and placing her bounty in a little basket. Now I would have a purpose for spending hours each day with her in our backyard. She and I would work together to create something beautiful that would nourish our bodies and our souls. Charmed by these notions, I was not going to let mere realities like cold, foggy summers, clay soil and no gardening expertise stand in the way of our little farm to table extravaganza. On the contrary, I shouldered a pickaxe and went to work. That was four years and many blisters and sore backs ago. Now several seasons into it, we sort of have a routine for our garden, even if we lack proficiency. Once spring has sprung, we dedicate a good chunk of one weekend to our garden. We turn the soil, add the compost (and worms), and give the newly-aerated earth a good soaking. This year, we timed our work to benefit from the weekend rainstorm (almost like experts). Then we plant things that we know will work and that the kids love (strawberries, corn, cherry tomatoes). We fill in with the basics (lettuce, chard and kale). We experiment with fun things like carrots, radishes and pumpkins. We build a sweet pea tee pee for hiding in and for munching. We have an apple tree and a blueberry bush that we battle with the squirrels and birds over. 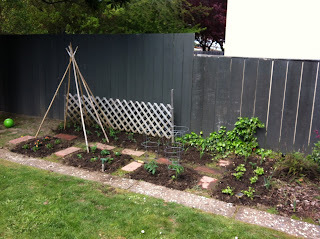 None of this is particularly complicated, not does it take up much space (our garden is only about 4X15 feet) or time. It is a fun way to spend a couple of quality afternoons with the kids, getting wet and dirty and exploring. A few plants get crushed by over-eager hands or feet, and some soil is certainly going to get tasted, but on the whole it is a really rewarding experience, and continues to be so over the coming months as the fruits and vegetables ripen. Among its many other benefits, gardening is actually quite a good work out. We are very pleased that we got our garden in last weekend. We are trying celery for the first time, and chives. We are also growing a bed of flowers because that is what my daughter selected. I have no idea if we were supposed to plant them in the shade or the sun, or how much to water them. If they survive, that is great. If not, there is always next year! 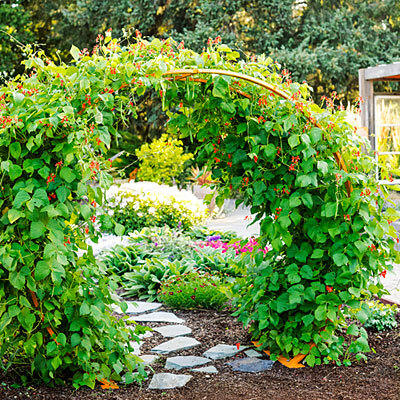 I am inspired to plant the arbor of scarlet runner beans that I saw in Sunset this month. Maybe that will be part of next weekend's projects.